A switcher pulls a cut of cars out of the class yard as a through freight enters the receiving tracks. There is just as much action going on at the operator's desk in front of the yard as well. Every little timesaver can help at a busy yard like this. ©2011 Ryan C Kunkle, licensed to About.com, Inc.
Railroad yards are dynamic and sometimes mysterious places. Yards are more than places to store cars. In fact, a railroad's goal is to get cars in and out of the yard as quickly as possible. Yards are used to take apart and make up trains for common destinations - like a post office on a larger scale. It is no wonder then that rail yards are an important part of any model railroad focused on prototypical operations. Once you understand how yards work, you can plan and build a yard of your own. But building a yard is only one part of making it work to its fullest. Like the prototype, we want to maximize the utilization of what we have - which often never feels big enough. And yard work should be enjoyable for operators and not feel like, well, yard work. Real railroads use paper forms called waybills to route cars to their destinations. In yards, railroads employ an army of clerks, computers, and technicians to make sure every car gets to the right track and train as quickly as possible. Most of us have a little less than that. But we can still recreate realistic operating patterns with our own waybills and other paperwork derived from the prototype. The easiest way to switch cars in a yard is to provide a hook or bin for each track and place the waybill for each car in the proper box as the car is switched onto that track. It is simple enough, but there is another tool we can use to make our yards even more efficient and our switching even faster. Best of all, this tool is just as cheap and simple as the waybills themselves - the pushpin. A pack of multi-colored push pins makes a handy and easy reference tool for marking yard tracks and destinations. If you have more tracks than pins, paint the top of the pin different colors for more options. You could also consider a small dry-erase board for really large yards. Either way, these simple tools will allow you to improve your track utilization and speed your switching. The waybill boxes for New Castle Yard are numbered to match the tracks. Routing for the cars on them are indicated by the pins. At this time, both tracks 3 and 5 are being used for Eastbound cars - just one of the advantages this system brings. ©2011 Ryan C Kunkle, licensed to About.com, Inc.
A common practice in model railroad yards is to assign a track to a destination. This works well so long as the destination requiring the most cars has the longest track. But as anyone who has operated a model (or real) railroad will tell you, what worked one month might not hold true the next. Shifts in traffic patterns are common. 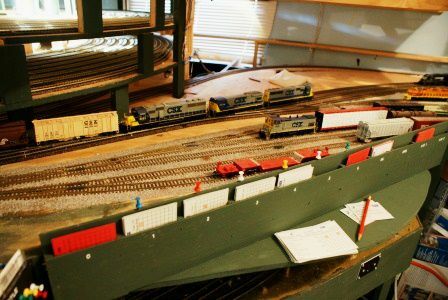 In a model railroad yard, even a few dozen cars could change the pace of an operating session. There are two solutions to this problem: build a bigger yard or don't permanently assign yard tracks. Guess which one is easier. In fact, although regular patterns emerge, most real railroads don't assign every yard track either. The hardest part of any railroad operation is trying to make track assignments. Without a crystal ball to see into the future, the best we can do is try to predict and make the best guess. That is why this system is so useful. If you do find you always end up using certain tracks for specific destinations, you can always assign them that way later. Here is where the useful push pin comes into play. Instead of assigning a destination to a yard track, assign it to a specific color pin. So Track 1, for example, is no longer "Albany," but "red." The Albany-bound cars can now be routed to any "red" track. By drilling a small hole on the waybill boxes, a red pin can be placed on any track in the yard. How does this improve efficiency? A couple of ways. If an operator sees a short track filling up, cars can be pulled and swapped to a longer track. By allowing multiple pins to be inserted in each track, a single track can serve multiple destinations. And a single destination can have cars on multiple tracks. When assigning multiple destinations to a single track, cars may need to be re-blocked to keep things organized. If you have the luxury of space, adding an extra overflow track to handle these random cars can be very helpful during a session. If you don't have room for a dedicated track, this system gives you the flexibility to use a recently cleared track for the same purpose in the short term. These open tracks can also be used to hold shop cars, misroutes or empties. A cut of cars is about to be switched over the hump. The switch list of pins shows this gondola goes to a red track, and the rotary switch is alligned accordingly. With clear instructions, the operator can switch this train as fast as the hump will allow. ©2011 Ryan C Kunkle, licensed to About.com, Inc.
Now that you've begun using the pins to identify yard tracks, the identification can be taken a step further to speed the switching process. Switching cars while filing waybills can sometimes get bogged down, especially for new operators or on a more automatic yard like a hump. To speed the process, cards can be sorted before switching and the moves laid out with pins on a simple chart. The yard crew picks up a cut of cars from the receiving yard, counts the cars and makes sure the waybills are in order. Starting with the last car in the cut (furthest from the locomotive, hence first to be switched) the operator checks the waybill and files it in the correct track box for its destination as marked by the colored pin. As each card is filed, a pin of the same color as the box is inserted into the appropriate hole in the pegboard. The operator starts at the bottom, so if there are 12 cars in the cut, the first peg goes in at 12, the next at 11, etc. Once all of the cards have been sorted and the pegs placed, all the operator has to do is look at the chart and line the switches. As you can see here, for this yard all of the switches in the ladder are controlled off of a single rotary switch. The switch is labeled for the tracks and also has places for the colored pins. It is also handy that the pegboard and switch are lined up with the lead to the hump. Once the cards are sorted, all the operator has to do is match up the colors from the board to the switch as the cars come over the hump! By not having to keep checking cards, not only is the operation much faster, the operator can enjoy it as well.